Back in late May, a league source familiar with the Celtics’ line of thinking brought up Marcus Smart, the bullish guard out of Oklahoma State and a top prospect for this year’s NBA Draft. The Celtics twice brought Smart in for predraft workouts, and then president of basketball operations Danny Ainge attended a third workout elsewhere. Truly, the team had its eye on him for some time, it snatched him up with the No. 6 overall pick Thursday. Here’s a look at which players have been chosen in the 2014 NBA Draft. Read: Discuss: What could these picks mean for Rondo? It might not have been a “fireworks” move that fans were hoping for after Celtics co-owner Wyc Grousbeck used that term to describe the possibility of big offseason moves, especially with players such as Arizona’s Aaron Gordon and Kansas 7-footer Joel Embiid off the board. But Smart, who averaged 18 points per game to go along with 5.9 rebounds and 4.8 assists as a sophomore last season, said he was thrilled when the Celtics drafted him. “It felt like fireworks on the Fourth of July,” he said in a conference call with local reporters. Eleven picks later, the Celtics selected Kentucky freshman guard James Young, giving the team two young players who should help bolster their backcourt. Smart, from Flower Mound, Texas, gives the Celtics depth at the point guard position, which they have lacked in recent years, forcing them to rely on shooting guard Avery Bradley and undrafted rookie Phil Pressey. But what happens with starting point guard Rajon Rondo? The four-time All-Star is entering the final year of his contract, and if Rondo leaves via trade or signs elsewhere when he becomes a free agent, the Celtics now appear to have a potential replacement. Grousbeck doesn’t think drafting Smart means much in terms of Rondo. “I don’t think this has any impact on Rajon at all,” he said. Teams have long called the Celtics to inquire about whether Rondo was available in a deal, and league sources said that teams will be calling even more now that the Celtics have Smart. “They will come after Rondo for sure,” one source said. DISCUSS: What could these picks mean for Rajon Rondo? One league source familiar with the Celtics’ line of thinking said that the team needs two point guards and could easily play both Smart and Rondo together on the court. Smart called it a “great opportunity” to play alongside Rondo. Smart returned to college for another year even though he would’ve been a lottery pick after his freshman season. Marcus Smart (right) is a Flower Mound, Texas, native who averaged 18 points per game last season for Oklahoma State. Smart, 20, is considered a point guard, though he can play both guard positions. Stevens said he believes the two can play together. And Ainge praised Smart’s versatility. Though some scouts and executives have questions about Smart’s shooting ability — he made only 42.2 percent of his shots last season and was 29.9 percent from the 3-point line — his leadership skills and intangibles were lauded by many. The one notable blemish on Smart’s reputation is from a Feb. 8 incident when he shoved a fan after a verbal spat during a game at Texas Tech, but Smart addressed it head-on during interviews with teams. 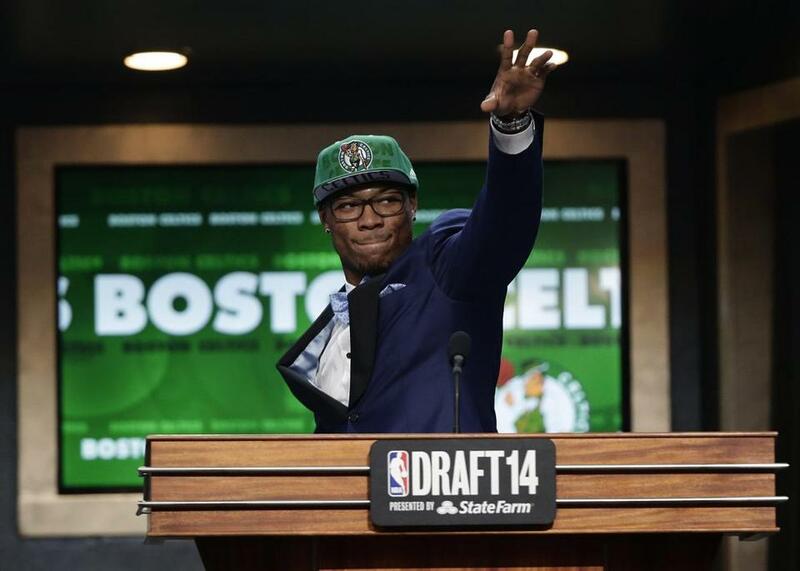 At 227 pounds, Smart is said to be NBA-ready from a physical standpoint, and the Celtics love his aggressive style. 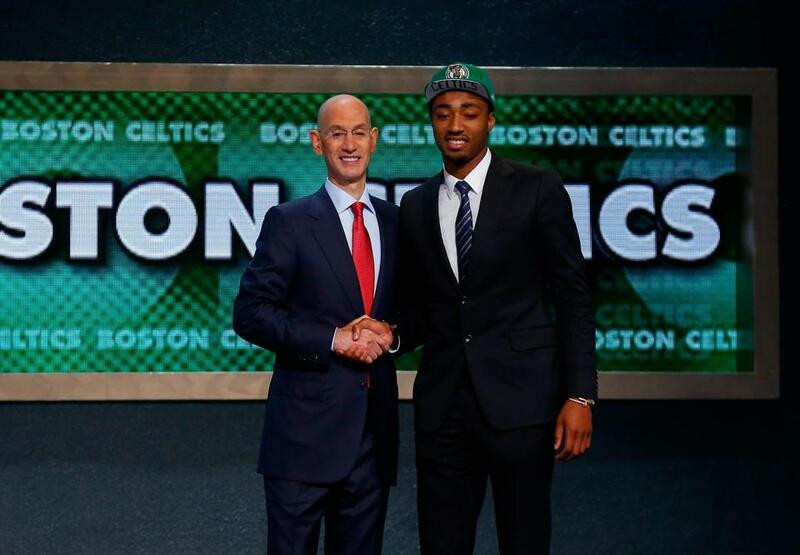 James Young (right) shook hands with NBA Commissioner Adam Silver. The Celtics’ second pick of the first round, Young, finished 10th in the Southeastern Conference in 3-point shooting (35 percent), giving the Celtics a perimeter scoring threat that they desperately need. Young won’t turn 19 until August 16, making him the second-youngest player in the draft behind Gordon. He was reportedly in a recent minor car accident that kept him from working out for several teams during the predraft process, which potentially hurt his draft stock. Young said he was excited to team up with Smart, whom he roomed with at the Chicago combine. And though the Celtics weren’t able to pull off any bid deals, Grousbeck said there is still time. • Discuss: What could these picks mean for Rondo? Baxter Holmes can be reached at baxter.holmes@globe.com.